You're a happy Ubuntu user who has set up your day-to-day system just the way you want it. You have everything tweaked to your liking, you have your lenses all in order, and you are humming along nicely in the digital realm. Yet, there's something nagging at you that you can't put your finger on. There's an urge – an unavoidable urge – that makes you wonder, sometimes aloud, "Gee, I wonder how other distro users live." Ubuntu users whose digital wanderlust is piqued have some options. To stay near the Ubuntu neighborhood, you could try one of the other distros in the Ubuntu family: Kubuntu, with the KDE desktop ; Xubuntu, featuring the Xfce desktop ; Lubuntu, showing off the LXDE desktop , and so on. You could even go out on a day journey in the Linux realm and use an Ubuntu-based distro like Linux Mint , Bodhi Linux , or others that use Ubuntu as their starting point. Or you could go all the way. You could grab your FOSS passport and leave the country, digitally speaking, and try something based on the source, or what Ubuntu calls "the rock on which Ubuntu is built." The rock is Debian, and you could try Debian itself or a Debian-based distro. In this article, I'll take you on a tour of one Debian-based distro, CrunchBang . CrunchBang is a Debian-based Linux distribution offering a great blend of speed, style, and substance. To achieve this, CrunchBang uses a window manager, Openbox , rather than a desktop environment like KDE or Gnome (Figure 1). In a nutshell, CrunchBang could be thought of as a layer built on top of Debian, specifically to provide a great Openbox experience. Figure 1: Using the Openbox window manager, menus which appear with a right-click on the CrunchBang desktop are easily modified by using Obmenu. A few words about window managers, for those who may be unfamiliar with them: Forget what you know about icons and desktops, because with a window manager, you'll be dealing with menus activated with a right-click on the desktop. Getting used to this new approach takes a little time, but the trade-off is low memory use compared to a desktop environment, allowing your hardware to devote memory to other things, such as running programs faster and more efficiently. 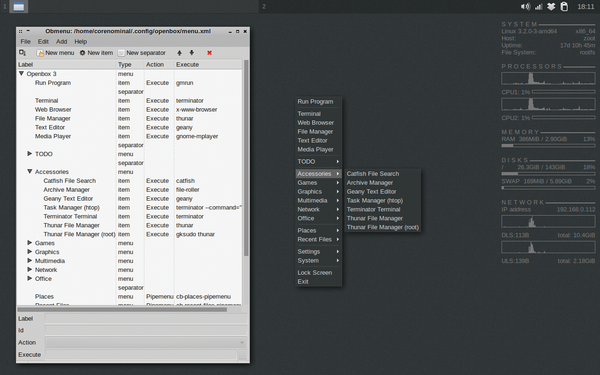 Once you get comfortable with the window manager, Ubuntu users should have no trouble working with CrunchBang. One of the things that people notice right off the bat is that you can get any desktop color you want, as long as it's black (Figure 2). There's a reason for that: CrunchBang offers you a clean slate to do whatever you want with the distribution. Figure 2: CrunchBang users can choose any default color they want, as long as it's black. CrunchBang provides a blank canvas. One of the great things about using a window manager like Openbox is that it allows you to change almost every aspect of how you interact with your desktop and invent completely new ways to use and control it. The desktop can be kept extremely simple, as it is in the default setup, or it can be set up to the level of complexity that you desire. Openbox gives you control without making you do everything. The primary aim of the CrunchBang project is to produce a stable distribution that offers the best possible Openbox experience. To achieve this goal, CrunchBang pulls many base packages directly from Debian's repositories, which are well-known for providing stable and secure software. Packages from CrunchBang's own repositories are then customized and pinned to the system, which is what makes CrunchBang, well, CrunchBang. Having said this, CrunchBang comes out of the box with many popular applications installed by default, as well as with the ability to play most popular media formats, which can be a make-or -break scenario when choosing a distro. Because CrunchBang is tied to the Debian repositories, items in the Mozilla family (e.g., Firefox and Thunderbird) are available as Iceweasel  and Icedove , respectively. If you're OK with the unbranding of Mozilla's fine products, both replacements work just as well. Not only can the Linux novice use CrunchBang with little effort, the "tinkerability" of CrunchBang is one of the draws for users who have experience with other distros. Some of the native applications made available (e.g., the highly tweakable Conky) offer a field day to users who have a hankering for modification. 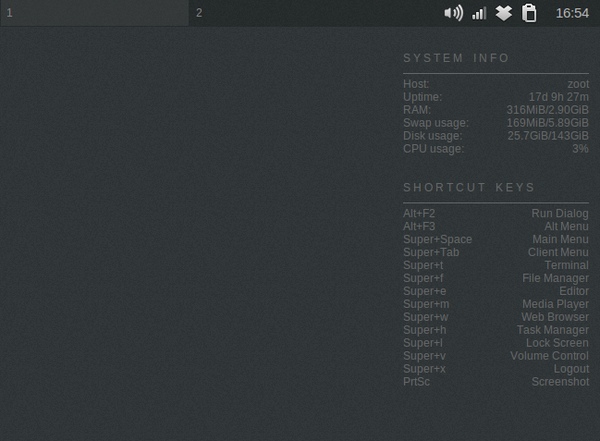 SpaceFM provides a solid file manager. With additional plugins, you can expand it into an optimized tool for all your daily tasks.